Lily: the champion pit BULL! I'm Lily and this year I'm a Bull for Halloween! I am about 2 years old and I'm a very good girl. I was once a stray dog on the mean streets of Baltimore until my mom rescued me. My favorite hobbies are squirrel-chasing, sock-chewing, snuggling, and meeting new friends at the dog park. 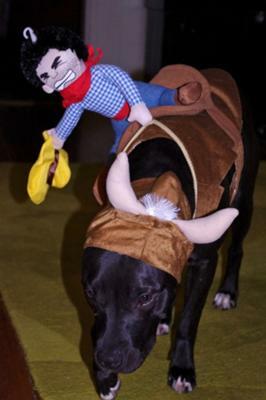 Since I'm a Bully breed dog, I thought this was a perfect costume for me!! I want to buck the bull rider off my back and eat him!! I should win because my mom says I'm a special girl. Comments for Lily: the champion pit BULL! Any time you embark on dissertation writing, they much you are thinking about is getting the best of it all. It is at this point that essay writing service review for students. Best Dissertation comes in handy and will take care of your needs. You will not struggle thinking whether this and that has been done. My Bella looks EXACTLY like your Lilly and she loves to chase squirrels too! Got to figure out how to post her pic. I mean it... EXACTLY!!!! She looks sad, I don't think she likes it very much. 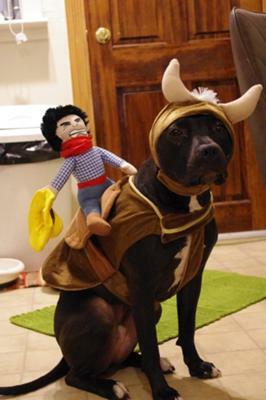 Save a horse ride a pitbull. I had seen this costume and actually thought this was made for a bully ;) And I'm so glad to see that I was right... totally made for Lily!